The Grumman HU-16 Albatross was used by the U.S. Air Force, the U.S. Navy and the U.S. Coast Guard primarily as a search and rescue aircraft. The Air Force used the aircraft extensively in Korea for combat rescue, where it gained a reputation as a rugged and seaworthy craft. The Albatross also was used as a passenger airliner serving island destinations in the Pacific and elsewhere. Its deep-V hull cross section enabled it to land in the open sea. It was designed for 4-foot seas but could land in more severe conditions while taking off in 8-10 foot seas using jet-assisted take off (JATO). 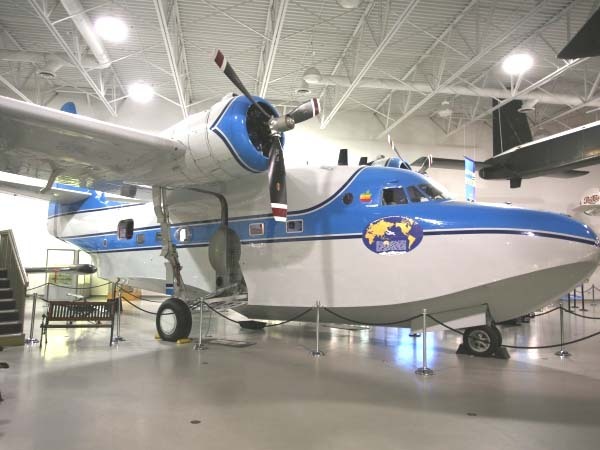 This particular Albatross, N44RD, saw adventure in 1997 as a filming platform and safety aircraft in support of a globe-circling expedition recreating the final flight of Amelia Earhart. Flown by local Bay Area aviators Andy Macfie and Reid W. Dennis, this aircraft became the first Grumman Albatross ever to fly a single purpose mission that circumnavigated the entire world.